I suppose I need to discuss Augustus Waters. I think most of you know who this person is by now. He is the love story that all of us want to have. He’s not cheesy, but romantic. He’s dynamic, but simple. 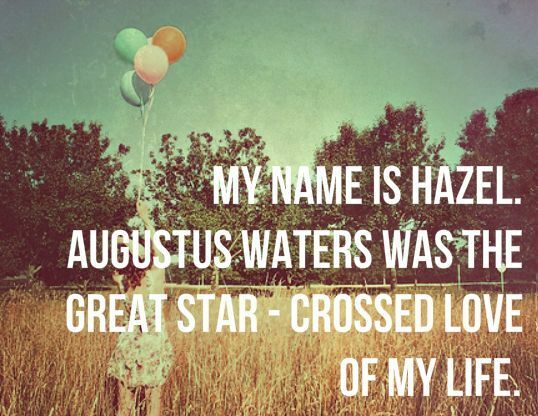 All of us fall in love with Augustus right along with Hazel Grace. The Fault in Our Stars is one of those stories that breaks your heart into a million pieces, but makes you feel like you have be reborn after you turn that last page. A person that doesn’t read wouldn’t understand what this means. It is truly spectacular how the writer can do this to us readers. One has to think that the author is a cancer patient himself, and perhaps he is Augustus in this book. However, he isn’t. John Green has never had cancer and isn’t our friendly character after all. So how could he find the inspiration to write about what we read before our eyes? “Well many years ago I worked as a student chaplain at a children’s hospital, and I think it got lodged in my head then. The kids I met were funny and bright and angry and dark and just as human as anybody else. And I really wanted to try to capture that, I guess, and I felt that the stories that I was reading sort of oversimplified and sometimes even dehumanized them. And I think generally we have a habit of imagining the very sick or the dying as being kind of fundamentally other. I guess I wanted to argue for their humanity, their complete humanity. So that was the initial inspiration. Writer’s have a few talents that the average person do not, but the one that amazes me the most is the ability to view a situation (good or bad) and turn it into a piece of art. It is like taking a picture of an object and describing everything about it. A writer describes the situation and weaves his voice through the gaps. If you are a parent and have read this I am sorry to say I do not know how to properly blog this book for you. First off I have to say that I would never recommend this book to my mother. I couldn’t put thoughts like that in her head, even though the book has one of the best stories I have read (not the best, I could never pick one single favorite story). I’m glad the writer didn’t emphasize too greatly on the parents’ pain in this book. I could never bare the thought of what these parents have to go through, and I think that’s one of the great things about this book that make it not like the others. As Green says in his interview, he wanted to not oversimplify the characters in his book like he has witnessed in other stories that he has read. I think focusing on the parents after the death of Augustus would have oversimplified not his cancerous characters themselves but would have made it like any other book about this disease and its ability to destroy the worlds around it. I have heard Hollywood wants to make a movie based on this book. I must say I really hope they don’t. I’m sure many can agree that Hollywood likes to take something great and completely kill it, but that is another post of its own. Please enjoy this great read before the movie comes out! Previous post: You read, for fun? Next post: Wanna read something different? Well hopefully the movie will be good all on its own!